Cut off the tough base of the asparagus and discard. Cut off two inches of the asparagus tips and stew on a low heat in one cup of water for about 3 minutes and save with liquid. In a 4-quart heavy saucepan, add onions, remaining asparagus stalks, garlic, onion, seasonings, water, and the liquid from the asparagus tips. 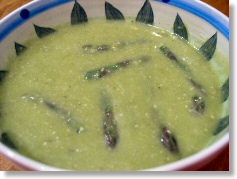 Simmer, covered, for 20 minutes, or until asparagus pieces are tender. Purée soup in blender. In final batch, puree cashews as well. Return to 4-quart saucepan, thin with water if desired. Add asparagus tips and serve. I also added about five whole wheat “croutons” on top when I served it.